HIGHLANDS  At about midnight Wednesday, October 29, a Harris County Sheriffs Deputy was travelling eastbound on East Wallisville Road crossing the intersection with Honeysuckle Street when an oncoming vehicle struck the deputys head-on, according to reports from the Sheriffs office. A dark colored Ford Explorer SUV travelling westbound on East Wallisville Road, crossed into the eastbound lane of traffic striking the Deputys marked patrol unit. The Deputys vehicle was spun counter clockwise into a roadside drainage ditch, as the Explorer spun into the center of the intersection. EMS personnel were called to the scene where extraction tools were used to withdraw the Deputy from his severely damaged vehicle. The Deputy was transported via LifeFlight to Memorial Hermann Trauma Center, where he was pronounced deceased at approximately 1:00 AM. The female driver of the SUV was transported via ground to the same hospital, where she is under the care of physicians. A male passenger was treated on scene, and is currently cooperating with traffic investigators. Deputy has been identified as Jesse Valdez III and the female driver as Kelly Jo Ivey, 29. The entire Harris County Sheriffs Office is in mourning following the news of the passing of one of its brethren in the line of duty. 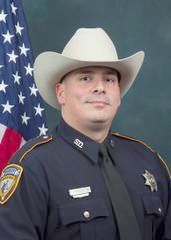 The 32 year old Deputy was an 11 year veteran assigned to the patrol bureau. Pending notification of the Deputys family, all identities are currently withheld. CROSBY  The School board here picked schematic designs and approved the start of construction for Cougar Stadium and the Crosby Baseball and Softball fields on Monday night. (that will no longer face the setting sun) with extra reserve season ticket seating features. Construction begins on the new Home-side as soon as football concludes this season. 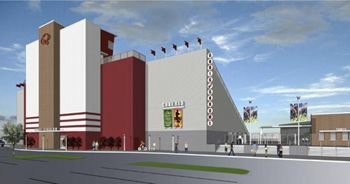 Although Crosby is hoping for a very extended football season, construction will begin on the now visitors side to transform it into the new home-side. Discussion of how to protect the track around the field during the process of football games was raised. The capacity of the homeside seating will be less than the 5,500 originally designed but width can be added on later for more seating in the event that become necessary. HIGHLANDS  A Crosby resident was honored by the local Masonic lodge with the Community Builder Award last Saturday. A solemn ceremony within Sampson Masonic Lodge #231 A.F. & A.M. presented Raymond Balcerowicz with the distinguished Community Builder Award October 25 at the Sampson Masonic Lodge in Highlands at 114 Avenue D. The Charter for the Lodge was granted on June 16, 1859. Craig Sorrels presided as friends, neighbors and family spoke only words of humor, reminiscence and praise to Mr. Balcerowicz. Sorrels described how the award is given to those that serve without expectation of reward. This meeting was in celebration of those that serve their community. Its history has not only included community leaders that should be considered but mostly those that serve without intent of recognition. Sorrels explained that Balcerowicz, a celebrated Crosby barber and gunsmith with shops just off 2025 Kennings Road, over the last 49 years, has rendered help to many men and women in the community both physically and monitarialy when they needed it most. He is known for lending a helpful and unselfish hand to those he encounters as needing help. Sorrels described how Balcerowicz earned the highest regard from his neighbors and community members. Specifically, he has often gone to the homes of those with injury or illness, unable to travel and cut their hair. During testimonials of Balcerowicz, his helpfulness was bestowed at times before help was asked. Also recognised was Balcerowiczs example as husband, father and grandfather of how a man should be. 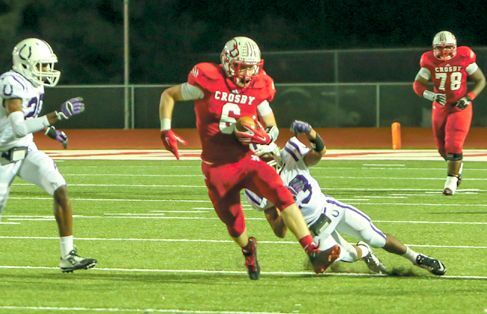 CROSBY  Cougar Field became hallowed ground where the greatest high school football game ever was meet and the Cougars emerged victorious 41 to 35 last Friday. He probably means that the number of times yellow flags hit the gridiron was significant. It certainly was common. There was an eternal pause early in the game as the score was 0-7 before the end of the first five minutes. It would take the rest of the first quarter for Crosby to put 7 on the board, too. That score came at the end of a dramatic defensive duel. The Cougars would take the lead for much of the rest of the game after Craig Williams would pull a 41 yard dash early in the second quarter. With about two minutes to go in the half the Broncos would answer the seven points with two field goals. Half time was a fine show of talent on both sides reflected in the 14-13 scoreboard. Dayton was holding the initiative but staggered by a determined Cougars defense. As the second half opened, the Broncos would score a touchdown on an incredible series of passes intermixed with fragile attempts to run and a bunch of call backs of first downs for the Cougars. Crosby would suffer 14 penalties at 126 yards back from the line of scrimmage but it would be more than 200 from the place the Cougar runner was taken down back to the penalty mark. Dayton would have 6 for 67 yards, including a single facemask called. Then the Cougars got their second wind and inside 30 play action seconds later would push in C. Williams at three yards after a dazzling 24 yard set up play. Just four minutes later Carlos Grace blitzed 10 yards unscathed amid a flurry of Bronco white and blue. Crosby would rack up 21 points in the third quarter and would need everyone of them. It was Carlos Grace again with a sky-grab from 10 yards out turn and run 18 more yards that would get the points. Trevor Larkin would catch three passes on the night to gain 99 yards for his team when they were needed most. Tristan Cotton would throw 22 times, connect for 9 but get picked three times with intermittent high pressure from the Bronco rush. There was no question that the third quarter was all Cougars. Convincing was T. Perry nabbing an interception and breaking initiative back to the Cougars. The Cougars it seemed had relegated the Broncos to the ground but the Broncos pulled every type of run imaginable burning up the fourth quarter until just 9 minutes were left. The Broncos Kyle McBride would carry the ball 11 yards himself to get a touchdown fifteen seconds later. Then he would make two more points by catching a pass from Keandre Rose. The Cougars appeared stunned by the dazzling mix of plays the Broncos were running. After two attempts to get traction the Cougars had to give the ball up to the Broncos again and with 16 seconds left, the Broncos would tie the score on a pass from Baughman to Jacarius Keener. The Cougars had amassed 289 yards to 186 on the ground and were behind 159 to 179 passing. As overtime began the Cougar defense was wiser and wilder in shutting down the run. The Cougars would hand off to Grace from fifteen yards out for his third touchdown with a lot of blocking and an open path to the goal. CROSBY  Early voting began on Monday and there is no shortage of local candidates this time. The Crosby ISD School Board has four positions that can be voted upon. Unopposed is John Swinney, taking the At Large Position from Dan Kasprzak, who at Monday nights Crosby ISD board meeting said he simply did not have the time to sign up to run for the post again. Position 1 sees Tonya Eagleton running unopposed. Position 2 sees JoAnn Crawford challenged by Kathi Whitworth and Joe Montemayor. John Lindsey is being challenged by Dan Meaux, the owner of the Crawfish Shak and Crosby-Huffman Chamber of Commerce Board member. Huffman ISD has two challenged positions. Becky Streetman is running against Rodreeb Carlile II in position 1 and in position II Vernon Reed is challenged by Scott Clobertants and Jerry Jones. Barrett Stations Municipal Utility District 50 has Simone Green and Rev. Malcolm Barrett for position 1. Robert Yarbourough is being challenged by Darrell EagletonJohnson in Position 3 and Position 5 is a challenge between S. Fontenot and Martin Lemond. Early Voting starts on Monday, October 20 and runs through Friday, Oct. 31, prior to the General Election to be held on Tuesday, Nov. 4th, according to Harris County Clerk Stan Stanart. NOTE: A photo ID will be required for both types of voting. Voters will be deciding on a Constitutional amendment, candidates for state and local offices, and school board trustees. Hours for Early Voting are Oct. 20 to Oct. 24, 8:00am to 4:30pm; Oct. 25, 7:00am to 7:00pm; Oct. 26, 1:00pm to 6:00pm; and Oct. 27 to Oct. 31, 7:00am to 7:00pm. Any registered voter may cast an early ballot at any early voting location. Regular Election will be Tuesday, Nov. 4 from 7:00am to 7:00pm. On that day you must vote in your assigned precinct location. Mercer Park Baldwin Boettcher Branch Library, 22248 Aldine Westfield Road, Humble 77338. Candidates seeking election include U.S. Senator, U.S. Representative from several Texas Districts, Texas Governor and Lieutenant Governor, Attorney General, Judges, State Senators, State Representatives, Harris County District Attorney, and County Judge, Clerk, District Clerk, Treasurer, and Pct. 2 & 4 Commissioners. Running unopposed are some incumbents, including Harris County Pct. 2 Commissioner Jack Morman, and Justice of the Peace Don Coffey. The Constitutional Amendment asks voters to approve transfer of money from the Rainy Day fund, to the Highway fund for roads construction. A Sample Ballot is viewable at www.HarrisVotes.com or www.LWVhouston.org. 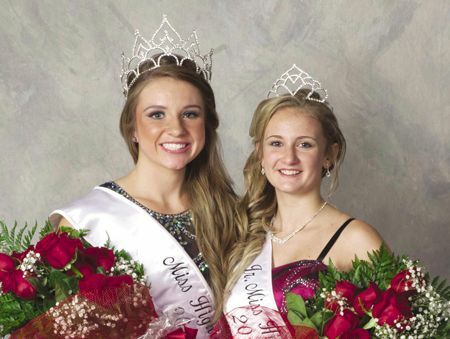 HIGHLANDS  The 57th Annual Miss Highlands Pageant was held last Saturday, with ten girls competing for the top title, and another ten competing for the junior honors. Two competitions were held, at 2 and 7 pm at the Highlands Junior School auditorium, with a full crowd in the audience hoping their favorite would take away the title. The Pageant show was emceed by Baytown police assistant chief David Alford and the 2013 Miss Highlands, Taylor Moser. Originally the pageant was part of the Highlands Jamboree, but in recent years has been sponsored and run by the Highlands Horizons. Pageant directors for Miss Highlands are Norma Cotten, Pam White, Carol Forrest, Chrissa Teel, and Becky Baumbach. Directors for Junior Miss Highlands are Ashley Forrest, Delene Cotten, Kathryn Dunlop, Laura Little, and Jamie Gonzalez. The pageant receives strong support from the greater Highlands business community, and Goose Creek schools. This year the theme was Salute to the Armed Forces with decorations on that theme, and a donation bin to benefit the USO. Proceeds from the pageant are used by the Horizons for scholarships, and to help needy families in the community. In 2013 the organization was able to award 12 scholarships to deserving graduates. Contestants competed and were judged in casual wear modeling, talent, dress modeling, and interview questions and responses. An additional award, the Jennie Robbins Community Service Award, was given to Katlyn Burns for community mindedness and dedicating her time to serve and help others. Presented by Kathryn Robbins-Dunlop. It was a Black & White night for the Crosby Education Foundation (CEF) as it hosted its Fourth Annual Grants Gala this past Friday at the Crosby Knights of Columbus Hall. The Grants Gala, held annually to raise funds to provide grants to Crosby ISD teachers to impact the learning experiences they provide to Crosby ISD students, featured fine food, fine attire, as well as fine music provided by The Busch Administration with Coy Killion, Cody Kouba and Friends. Guests generously took part in a live and silent auction. Whether one wanted to yell GOAL at a Houston Dynamo game or enjoy a quiet movie night at home, there was a wide variety of items to be won during the silent auction. Sports memorabilia featuring JJ WATT, exciting fishing or hill country excursions, and handcrafted outdoor products highlighted the live auction. 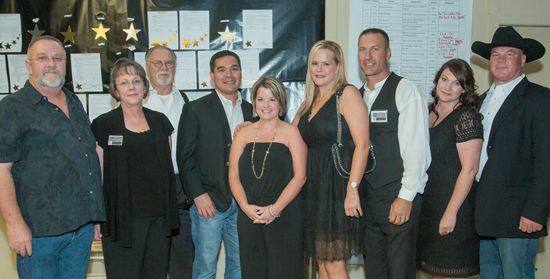 Preliminary results indicate that the gala raised approximately $76,000 for Crosby ISD programs. This tremendous amount is representative of the great support the Gala received from underwriters, sponsors and attendees. CEF was formed for the purpose of partnering with Crosby ISD and the local business community to enrich teaching, inspire learning and maximize opportunities for all Crosby ISD students. The fall grants gala and spring golf tournament serve as CEFs primary fundraising vehicles. BARRETT STATION  A man was shot in the back during an altercation last Thursday. The Harris County Sheriffs Office Deputies were called to the intersection of Cottontail and Joan of Arc St. on Oct. 2 concerning a shooting. A man was found laying in a field near Rubin White Drive at about 9:00 p.m. Deputies say he was alert and refusing to answer any questions concerning an incident that had left him with a gunshot hole in the middle of his back. The victim was first attended by HCESD#5 ambulance crews. The man was taken by Lifeflight helicopter to Herman Memorial Hospital in stable condition. Detectives found the victims vehicle shot numerous times. Another vehicle was found directly behind the shot up victims vehicle with a semi-automatic weapon inside. As the investigation continues, Deputies had learned that a shooting suspect fled the area right after an altercation. Locally, it is said a young guy flashed a roll of currency bills about 4 inches in diameter and was subsequently shot. The names have not yet been released pending further investigation. Following the Lifeflight and while Detectives were investigating, a radio dispatch call for Crosbys area ambulance, HCESD#61, to return to the scene for an unknown problem were made. 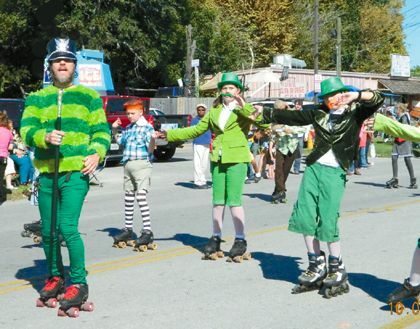 HIGHLANDS  Theres No Place Like Highlands was imaginatively displayed in the parade units last Saturday, as the community enjoyed the many floats and units that keyed on the yellow brick road theme of the artwork, and took cues from the classic Wizard of Oz movie. The 58th annual Highlands Jamboree was held under some of the best weather possible, cool and sunny and perfect for a parade. About 100 units participated, and with two marching bands, 22 Miss Highlands and Jr. Miss Highlands Pageant entrants, and 11 fire vehicles, the participants numbered close to 500. Parade watchers stretched from E. Houston Street to Jones Road along Main Street. The Jamboree is a benefit fund raiser for the Highlands Lynchburg Chamber of Commerce, and is now in its 58th year, having started in 1955 at a celebration of the opening of the new Highlands State Bank. The day started with a 5K Fun Run/Walk at the Community Center, benefitting Habitat for Humanity. Next was the traditional parade, with Weston Cotten, last years Terry Davis Award winner, as the Parade Marshal in the lead car. The Terry Davis Award goes to a person who emulated the namesakes unselfish work to better the community. After the parade, the crowd moved to the Highlands Elementary School, where the Childrens Pageant was held, as well as a silent auction and crafts booths. A large crowd was present, almost filling the multi-purpose room, as children from 0 to 11 years of age competed in the Lil Miss & Mister Highlands Childrens Pageant. Named as Little Mister Jamboree was Jagger Constance, an adorable young man who exhibited a swagger and self-assurance among all those girls and a huge audience. The Little Miss Jamboree was won in seven categories by age, see the list on page 10. The crowd at the school was so large that the refreshment stands ran out of food and closed early. The final event of the day was judging for the Car Show, under the direction of Dickie Woods. Doug Cox won in 3 of the 4 categories. 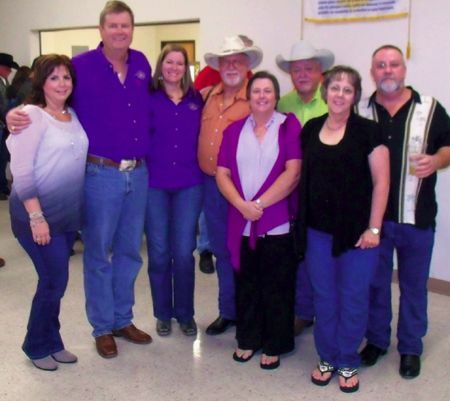 CROSBY  The Cody Stephens Memorial Foundation Go Big or Go Home Banquet and Auction brought together the best of east Harris County in optimism and efforts to save the lives of young athletes. About 450 people attended the banquet and among these were represented most of the organizations and groups that are involved in one way or the other in improving life locally. The Cody Stephens Memorial Foundation is about saving young athletes lives by testing for Sudden Death (S.D.) or Sudden Cardiac Arrest due to heart conditions. The foundation and others are promoting testing called an E.C.G. and having that test reviewed by a cardiologist. The Foundation has helped numerous schools throughout Texas fund the testing and has enlisted the help of hospitals and cardiologists in making the test more affordable. During the event, Scott Stephens, father of Cody, displayed the new E.C.G. devise that can be used to perform the test. It is now about as big as the new I-tablets that people use for computer work mobilely now. It once was wheeled in within a cart about 4 feet high. What began as a effort to get more testing done in local schools for S.D. has become an effort to have the test performed statewide to save more than the eight lives that can be verified since the extra testing has been begun. In attendance were not only were Dan Huberty, R., and Wayne Smith, R., local Texas House Representatives but also Kathy Grant and David Courreges lobbyists that undertook getting Texas legislation passed pro-bono for the Foundation to have mandatory E.C.G. testing throughout the state. Unable to attend but backing the bill is Representative Sylvester Turner. Stephens expects opposition to the Cody Bill this year. The American Heart Association is not in favor of mandatory testing for S.D. The Heart Association expressed fears that others would not do the testing correctly in a recent article. They favor individual testing sporatically at the current rate. The entire event was filed with ironies and harmonics. During the shotgun card raffle, the seven of diamonds was pulled first it was one by Codys brother (on money loaned him by his grandfather) but his father requied him to not accept the win then the six of spades was pulled next. All familiar with the event know that Cody Stephens football number was 76. The live auction pulled in $76,000 in total. The top auction sale was a Cody Stephens #76 football jersey to David Mendez of Turner Chevrolet for $4000. In other events,the Silent Auction or Table Sales was $20,000. Corporate sponsorship came to $9,000. Sponsorships from Crawfish Shak and Oil Well Tubular helped make that mark. Her organization is the national organization of parents that have lost children sudden cardiac arrest and promotes awareness of testing and treatment of athletes.